Can I move the nest? If you move the nest, the female will abandon it. 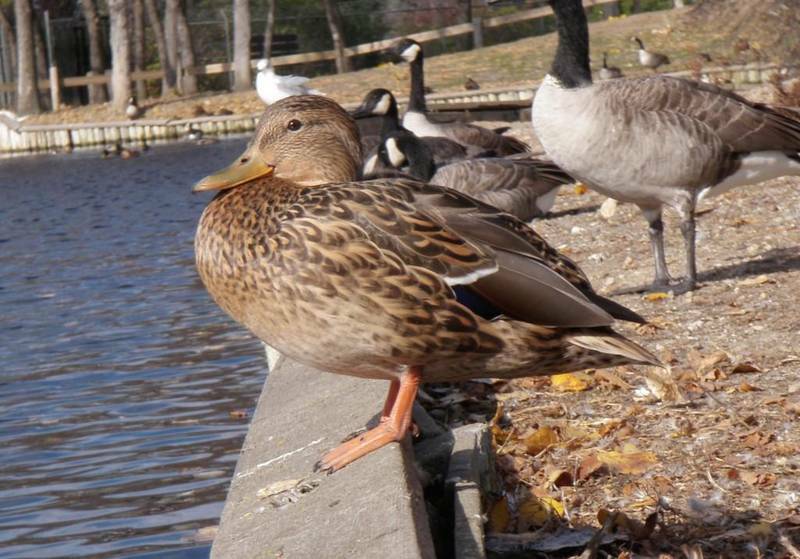 Ducks are a migratory bird and are therefore protected under the Migratory Bird Convention Act. It is against federal law to harm or destroy migratory birds or their nests. So no, you cannot move the nest. I have a duck nest in my backyard. What should I do? The duck has chosen your yard for some reason, known only to her. Do not be alarmed. Chances are you will barely notice she is there. In the wild, Mallard ducks have been documented nesting as far as a mile away from water. Once the babies hatch she will move them to water. Do NOT put food out near the nest for her. This may attract cats, dogs, or crows who may eat the eggs or female duck. The female will take about 7-10 days to lay all of her eggs. While she is laying the eggs she will not sit on them, instead she will just be loitering around. The best thing you can do is leave her alone and continue with your normal routines. Once all her eggs are laid (typically 8-12) she will begin incubating them for 23-30 days, and will sit on the nest almost continually. The female will leave the eggs for a short time each day to get food and water, which is normal. Now the duck nest has hatched and the female has a group of ducklings in my backyard. What should I do? The best thing to do is let the mother take her babies to the closest body of water on her own. She will know where this is. If she is successful at getting the ducklings to safety, your yard was a good place to nest. If the ducklings cannot survive without human assistance in an urban environment, then the female should not have chosen this location. By assisting a mother and brood of ducklings to the safety of a marsh, we reinforce to the female that this particular backyard is a good place to nest and she will likely return to this location to nest year after year. It has been shown that up to 47% of successful Mallard females will return to the same location to breed in subsequent years (Przemyslaw, M. And P. Beszterda. 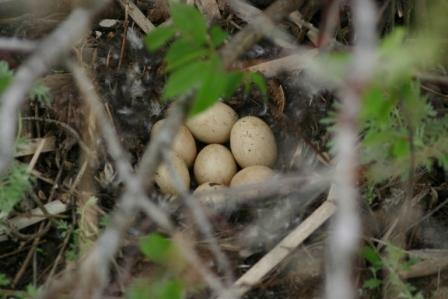 Influence of Nesting Success on Female Homing in the Mallard. Journal of Wildlife Management. vol. 54: p. 459-462.) It is best for the female to get her brood to water on her own. During the summer, Wascana Centre receives over 100 unique duck calls. We are unable to respond to these calls because of the extremely high volume. I have found a single/group of ducklings and the mother is gone. What should I do? The best thing to do in this situation is to leave the ducklings alone and let nature take its course, as difficult as that may be. There is a reason the duckling has been left behind (perhaps it is too weak to keep up, or not as fit as its siblings). 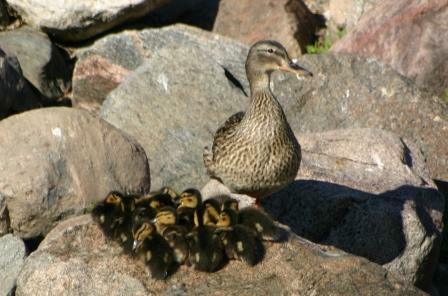 Mallard hens lay 8-12 eggs because most of the chicks will not survive to maturity. 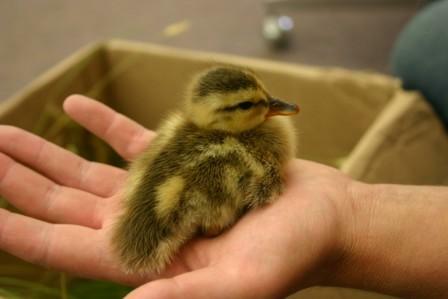 It is illegal for a person to keep a wild duckling as a pet. In the event a child or pet brings home a duckling, do NOT play with the duckling(s). Handle them minimally at the utmost. Get them back in the wild as soon as possible. The more you interact with a young duckling, the greater chance it will imprint on humans. This could be detrimental to the bird as it matures, as well as during hunting season when a habituation to humans could cost it its life. I think this young animal/bird is orphaned. / I have found an injured bird. What should I do? / Other wildlife related questions. Visit the Wildlife Rehabilitation Society of Saskatchewan website for detailed information on these or other situations, or call their Wildlife Hotline at 306-242-7177 for more information. Are there fish in Wascana Lake? In the spring of 2011, the Saskatchewan Ministry of Environment with assistance from Wascana Centre conducted a small sampling of Wascana Lake to determine current fish populations. Only Common White Suckers were trapped during the sampling period. Since then, Common Carp appear to be increasing in numbers in Wascana Lake and have been a regular site in the lake and marsh. Carp, like White Suckers, are a non-game species. There have been anecdotal observations of Northern Pike in the lake, but the sampling demonstrated that if game fish do exist in the lake they are rare and no significant populations exist. Is fishing permitted in Wascana Centre? No fishing is permitted in Wascana Centre at any time of the year as per PCC Bylaw #6 "Fishing within Wascana Centre is prohibited." Like almost any animal, domestic or wild, coyotes do have the potential to be dangerous. However, a normal coyote is afraid of humans. In almost all situations where human-coyote conflicts have occurred, the coyote was being fed directly or indirectly by humans and had lost its fear of humans. Thus it is important to maintain and reinforce the coyote’s fear of humans to avoid conflicts. What should I do when a coyote is noticed nearby? Raise your hands over your head to make yourself appear larger and shout at the animal. You can clap your hands as well. Do not run away, simply back away slowly. Never try to touch, feed, or leave food for the coyote. You can leave a message for Wascana Centre’s ecologist if you observe a coyote within the park. Include when, where, and any other relevant information. To better understand coyote movement patterns within Wascana Centre, sighting information will be recorded and mapped. You can reach our ecologist by calling 306-522-3661 or by emailing an ecologist. What does a coyote look like and how big are they? Coyotes are medium sized canines that vary in color from gray-brown to yellow-gray and any combination of those colors; the belly and throat are cream-colored. They have a bushy tail with a black tip that is often held low behind the legs. Coyotes often appear large, especially in winter, due to their heavy fur coat and bushy tail. Coyotes are quite small, 9-16 kg (20-35 lbs) for adults, roughly the same size as a beagle or springer spaniel. How will coyotes react to dogs? In most cases a coyote will simply wander off when a person with a dog approaches. In rare cases coyotes can view small dogs as food items. If a coyote appears curious about your dog or does not leave your immediate area upon approach, use the scare tactics mentioned above. Other jurisdictions have found that when dogs are leashed problems do not occur. Wascana Centre Authority recommends that your dog be leashed at all times, regardless of coyotes. Coyotes can live as solitary individuals, transients, monogamous pairs, or in family groups (an adult pair and young of the year). Because coyotes only come into Wascana Centre in the winter, only single or pairs of coyotes are observed in the Centre, asthe young of the year have typically dispersed from their family group by this time. Why not just remove the coyotes? Problem animals will be removed if necessary and situations with problem animals will be dealt with on a case by case basis. However, research has shown that removal (i.e. trapping, relocation, shooting, etc.) is ineffective in reducing coyote numbers. As coyote populations decline litter sizes increase, thus there is always another coyote to take the place of the one that was removed. The best approach is to learn to understand the coyote and reduce their habituation to humans by consistently using the scare tactics discussed previously. For more information on how other urban centres are co-existing with coyotes, check out websites from Vancouver and Edmonton.